Complete 10ft pop up display packages include Velcro-Ready Fabric Panels or Custom Printed Graphic Panels, molded wheeled shipping cases & Lifetime Warranty. Optional items include interactive Monitor Mounts and Tablet Mounts, along with case to counter podium Kits and LED Lighting. Premium Full Height Pop-Up Display Package Includes Complete Set of Velcro Receptive Fabric Panels & Wheeled Shipping Cases. Set-up size: 10' wide x 90" tall. Premium Full Height Pop-Up Display Package Includes Custom Graphic Center Panels, Velcro Receptive Fabric End Caps & Wheeled Shipping Cases. Set-up size: 10' wide x 90" tall. Premium Full Height Pop-Up Display Package Includes Custom Graphic Center Panels, Custom Graphic End Caps & Wheeled Shipping Cases. Set-up size: 10' wide x 90" tall. Premium Straight Full Height Pop-Up Display Package Includes Complete Set of Velcro Receptive Fabric Panels & Wheeled Shipping Cases. Set-up size: 9'2" wide x 90" tall. Premium Straight Full Height Pop-Up Display Package Includes Custom Graphic Center Panels, Velcro Receptive Fabric End Caps & Wheeled Shipping Cases. Set-up size: 9'2" wide x 90" tall. Premium Straight Full Height Pop-Up Display Package Includes Custom Graphic Center Panels, Custom Graphic End Caps & Wheeled Shipping Cases. Set-up size: 9'2" wide x 90" tall. Premium Full Height Pop-Up Display Media Package Includes (1) Monitor Mount Kit, Custom Graphic Center Panels, Custom Graphic End Caps & Wheeled Shipping Cases. Set-up size: 10' wide x 90" tall. *Monitor not included. Premium Full Height Pop-Up Display Media Package Includes (1) Monitor Mount Kit, Custom Graphic Center Panels, Custom Graphic End Caps & Wheeled Shipping Cases. Set-up size: 9'2" wide x 90" tall. *Monitor not included. Make the most of your trade show display budget with our 1UP branded 10ft wide pop up display kits. Quality built since 1999, Affordable Exhibit Displays has been manufacturing and shipping our most popular display model. Our exclusive 1UP brand has everything you need to start promoting your brand or company immediately upon delivery. It's unwavering strength and reliability is like no other on the market today. Along with style and ease of use, our 10ft pop up display model is named "popup" due to the popping-up action of the frame when set-up. As one of the most portable show display solutions available, you'll appreciate the effortless set up in 20 minutes or less with no tools required. At a great dollar value, you won't see us skimp on materials used for construction of the 1UP brand pop up display. 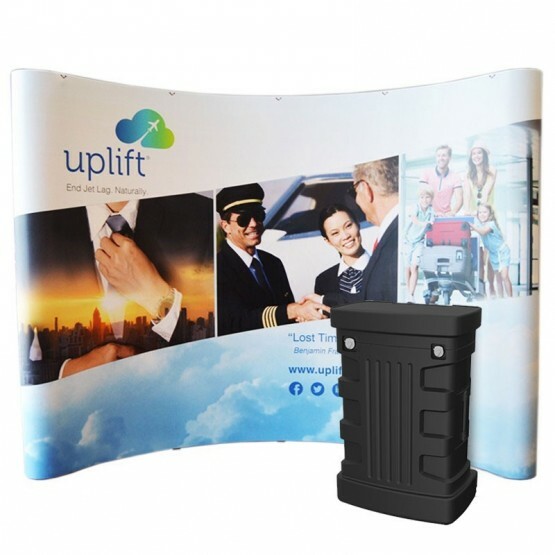 The 10ft 1UP system features several unique advantages over similar pop up display units, including it’s ‘convertible’ feature allowing you to add on or subtract to form a larger or smaller backwall. Another great feature is the effortless auto-click Neodymium magnetic system that locks your aluminum frame into place and allows for seamless attachment of your fabric or graphic panels every time. Taking pride in providing you with a top-notch quality product is first and foremost. Assembly and graphics printing of all our 1UP brand pop up display units take place at our Maine USA production facility. As a bonus to you, all 1UP frame components include a full Lifetime "No Questions Asked" Warranty. And with the <1% repair rate, we guarantee your 1UP pop up display with work for you show after show, year after year. So what are you waiting for, get you order started now! Choose from either in the characteristic curve frame or straight frame layout. Then choose either full Premier brand Eco-fabric® Velcro® receptive fabric panels, a Premier brand Eco-fabric® Velcro® receptive fabric/full color graphic combo, Complete full color graphic panels, or Interactive Media Graphic kit. Next add some creativity to your tradeshow display floor space with the new interactive monitor bracket and iPad or Samsung tablet holders. Or draw attention to your pop up display with accent LED lighting. When designing your artwork, make sure to use vibrant colors and photos to add the attention you are looking for. Or just ask about how we can help with the designing a professional graphic layout for you. We have in-house graphic designers specializing in trade show display graphic design. Call 800-723.2050, chat or contact us and get started on your project today!